Businesses did not have a positive outlook on the Myanmar business sector last year with falling confidence and firms pulling out of Myanmar. From October 1 to December 21 of 2018-2019 fiscal year, the country’s external trade volume hit USD 7300.518 million, up 530.974 million USD compared with the same period last year, according to the figures from the Commerce Ministry. On November 11, 2018, online shoppers in Myanmar purchased goods worth US$90,000 on the Internet within the first hour of Alibaba Group’s global 11.11 sale. It was the first time the Chinese e-commerce giant had opened up the annual event to Myanmar, where just 1 percent of the population is exposed to e-commerce. Export earnings from Beans and Pulses may reach up to one billion dollars, said Zaw Min Win, President of Union of Myanmar Federation of Chambers of Commerce and Industry, at the 24th annual meeting of Myanmar Bean and Pulses and Sesame Merchants Association. The total power production has reached more than 2,100 megawatts, according to the figures from Ministry of Electricity and Energy. Myanmar leader has rejected a suggestion she is soft on the military, which the United Nations has accused of ethnic cleansing, saying her relationship with the generals was normal and her objective was national reconciliation. Myanmar is planning to implement digital marketing to develop the country’s hotels and tourism sector, especially to increase promotional work to attract visitors from China’s Hong Kong and Macao Special Administrative Regions (SAR), Myanmar News Agency reported Sunday. The number of factories in Myanmar allowed by the European Union to export naturally caught fish and prawns has increased from 21 to 23, according to the Fisheries Department. Myanmar authorities have seized illegally transported snakes in Hsenwi township, the country’s northern Shan state, the official Global New Light of Myanmar reported Sunday. The United States will contribute nearly $32 million in humanitarian aid to help Rohingya Muslim refugees, the State Department said Wednesday, in the Trump administration‘s first major response to the mass exodus from Myanmar. Myanmar registered a total of 206 human trafficking cases in 2018, in which 317 people including 25 children were victimised, the Anti-Trafficking Police Force said last Friday. As the 2020 elections draws closer, there is no indication that parties in the country will change their attitudes towards the Rohingya crisis, says one observer. Rakhine insurgents have killed 13 policemen and injured nine in attacks on four police posts in Myanmar’s Rakhine state as the country marked Independence Day, the official news agency said. China expressed in its message of felicitation sent to Win Myint, President of the Republic of the Union of Myanmar on the occasion of the 71st Anniversary Independence Day of the Republic of the Union of Myanmar that China-Myanmar relations are deepening and cooperation in various fields continues to make new progress. Thanks to the EU’s Generalised scheme of preferences (GSP) right, Myanmar can create 0.6 per cent jobs. If the GSP right remains, the employment rate may increase to six per cent of the total population, said Aung Naing Oo, Director General of Directorate of Investment and Company Administration (DICA), at a talk titled “Democracy, Poverty and GSP” at the Union of Myanmar Federation of Chambers of Commerce and Industry (headquarters) in Yangon on January 5. New school construction guidelines are aimed at making education more inclusive and accessible while also ensuring that schools can serve their communities as safe and secure shelters during natural disasters. Myanmar domestic workers dressed in their ethnic costumes performing a dance as the Foreign Domestic Worker Association for Social Support and Training (Fast) celebrated Myanmar’s 71st Independence Day, which fell on Friday. Yesterday’s event was held at the Fast Befrienders Clubhouse in Jalan Bukit Merah. Myanmar is planning to implement digital marketing to develop the country’s hotels and tourism sector, especially to increase promotional work to attract visitors from China’s Hong Kong and Macao Special Administrative Regions (SAR). 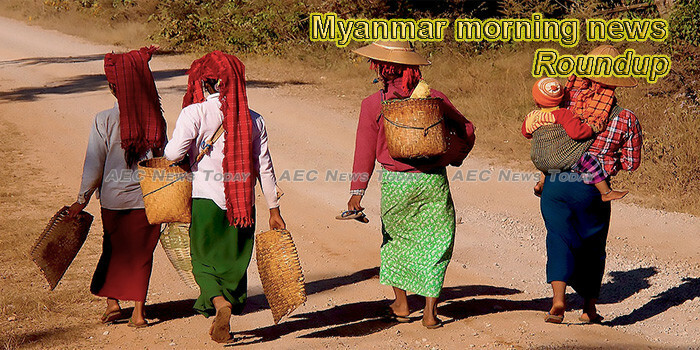 More than 200,000 Myanmar workers left for other countries to find their jobs under a MoU system last year, most of whom went to Thailand, according to the monthly report issued by the Labour Department at Ministry of Labour, Immigration and Population. Thousands of people have been displaced in Myanmar after clashes between a Buddhist rebel group and security forces.